Isotelus maximus range in size from less than a millimeter to as long as 24 inches. The exoskeleton of this giant of trilobite is usually found in fragments. For this reason, most people only find parts of Isotelus trilobite. Isotelus maximus has been found whole, but this is quite unusual and a great treasure. Usually, complete specimens of Isotelus are found in hundreds of pieces that must be meticulously reassembled. You will probably be satisfied finding parts of Isotelus often several inches long. You may get lucky and find a complete specimen of enrolled Isotelus as small as a pebble. The pictures below will help you find and identify evidence to what this fascinating giant trilobite looked like. Enrolled Isotelus maximus courtesy of Ron Fine. This is an Isotelus eye. The eye appears as a smooth bump on a cephalon fragment. This fragment of the genal area shows part of the genal spine and a distinct hole that characterizes the genal area. This is a genal spine. It is one of the most common fragments of the Isotelus found. Here, the entire "free cheek" was found encased in crinoid stems and matrix. Note the apparently large eye. The hypostoma, or "mouth plate" of the Isotelus is a very recognizable body part that is commonly found as the result of molting. Found on the underside of the trilobite, the hypostoma looks like a pair of fang-like lobes with distinctive curvy lines and a pair of "dimples" above the lobes. Oddly enough, one lobe is typically bigger than the other. Click the picture to see these markings. 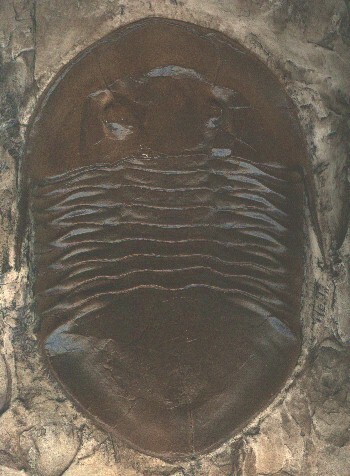 The side shown in this picture faces outward on the underside of the trilobite. The other side of the Isotelus hypostoma also has distinct markings. Fine ridges like corduroy run diagonally across each lobe. The interior of the hypostoma is hollow. The center of the Isotelus hypostoma is often found separated from the two lobes. The result is a shell fragment with what appears to be a lip. This is a loosely applied description because if trilobites had lips, they would certainly be soft body parts. The pygidium, or "tail section" of the Isotelus is one contiguous plate. Consequentially, it is often found complete in the fossil record. However, small fractures are usually visible due to the exoskeleton's fragile nature. The ends of thoracic segments are often found cemented together in groups preserving the distinctive shape of the pleural lobe. Individually, the ends of each thoracic segment resemble the paddle on an oar of a boat. This commonly found fragment is often mistaken for a hypostoma (mouth plate), but is missing the fine lines on its surface. Occasionally, you will find part of a pygidium of Isotelus with one or more thoracic segments still attached. This is a rare treasure. Single thoracic segments are often found on the surface of a rock. It appears as a unique brown stripe. The trilobite anatomy chart was done with an Isotelus replica from a specimen found by Dan Cooper, Dry Dredger member. The Isotelus fragments shown are from the collections of the Dry Dredgers, an association of amateur geologists and fossil follectors. The Cincinnati Trilobite Fragment Identifier was written and produced by Bill Heimbrock, Dry Dredger member.